For the construction of glass components two parts are welded with hot air. As the material is very fragile the welding process must be carried out very carefully and precisely (1 µm) despite of the speed in order to avoid the breaking of the parts. Furthermore, it must be made sure that the glass components are close enough to guarantee a good quality of the weld seam. Thus the position of the component shall be acquired in intervals of 200 ms.
For the position acquisition of the glass components the Ethernet counter system MSX-E1731 with EnDat 2.2 sensors has been chosen due to its speed and precision. 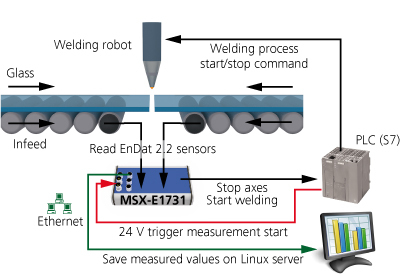 At the beginning of the welding process the SPS triggers the MSX-E1731 system to start the measurement process. As soon as the glass components are in the correct position the system sends two signals: One for the digital output to stop the axes and via Ethernet the start signal for the welding process. When the welding phase is over all acquired data is transferred to a Linux server for archival storage.